Thank you to the families and friends who have purchased one of our dachshunds and given them a loving, nurturing and stable home. One of the biggest blessings along this journey, is meeting new people from all walks of life and making new friends who share a common interests in taking care of these delightful creatures God has made. They truly are therapy dogs, their love knows no bounds, especially when lots of love, time, consistency, patience and understanding are given to them. They are truly committed and loyal to their masters/owners! 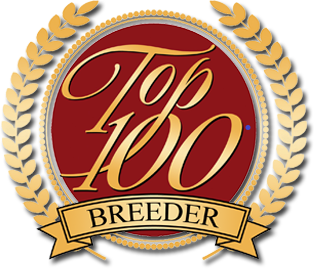 "After several months of looking for a good dachshund breeder, we happened upon Bountiful Dachshund's website. I was impressed with the information Lynn had on the site and decided to call. After our first conversation, I knew Lynn was the breeder for us. Her dogs were beautiful and she spoke of them as if they were family. We got Willow on Christmas Eve 2011 and Neyland in April 2012. 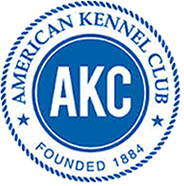 We were very impressed with Lynn and the care she takes with each of her dogs and puppies. The area in her home where she keeps all the dogs and puppies was clean and overall just a great "set up". Both our puppies have been healthy and such a blessing to our family. Lynn was so helpful in answering our questions. Corresponding with her was never a problem. I highly recommend Lynn as a breeder and I wouldn't get another dachshund from anyone else! "We adopted our new family member Kody Boy from Bountiful Dachshunds in June. Lynn was super nice and very helpful and accomodating. She kept in contact with us the first couple of weeks to help with concerns and questions. It is very comforting to know that Bountiful Dachshunds loves and cares for all their dachshunds very much and therefore are able to breed happy healthy puppies. Our little Kody has fit right in with our family and has been a joy to have around. Thank you Lynn!" The Gafney's of B'ham, AL. 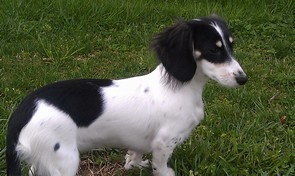 "The Bountiful Dachshunds website set Lynn apart from many others in the southeast that we had seen. So we made an appointment and placed a deposit to choose our puppies. When my husband and I visited her home, we knew as soon as we walked in that we made the right choice. Lynn greeted us with three of the sweetest girl dachshunds at her feet. They were beautiful, affectionate and well behaved. One of them was the mother of our puppies. We went into the side room of their home where the puppies were and there was so much sweetness in that room! Our puppies were only 20 days old and the entire litter of six greeted us with wagging tails. I asked my husband, who is a veterinarian what stood out the most during our visit and he said that Lynn's ten year old retired momma dachshund came to him and asked politely to be picked up. He obliged and she instantly snuggled into his arms. Any dog that affectionate has been cared for lovingly and all her dachshunds were very friendly, healthy and happy. We left knowing Lynn does all that hard work because she loves animals just like we do. She obviously breeds for disposition and health which is what really matters to us. 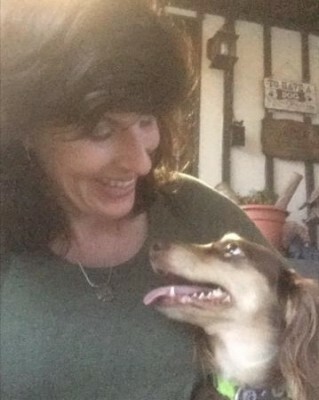 Lynn also wants other families to experience the love from a dachshund like her own family has received. What more could you ask? "Bountiful Dachshunds has the most precious and healthy puppies anyone could desire. Rudy and Bonnie were the parents of the little one we chose. Her name is Gracie Belle and she is absolutely precious and one year old now. People have often said she is the most beautiful dachshund they have ever seen. She is not only beautiful but has a million dollar personality. She can make me laugh even if I am not in laughing mood. Bountiful is the only breeder that I would buy a puppy from. Their puppies are healthy and they're loving Christians who put their hearts into their business/hobby. 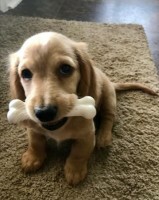 Before deciding where to go to buy my puppy, I read all the review of breeders in Alabama with long haired dachshund puppies for sale and go visit them. It was obvious, Lynn breeds for quality and not quantity and I went with my instincts and hit the jackpot! Thank you Lynn for providing such great care for our girl!" A big shout out to Margaret S. and Auggie (a pup from our Molly and Wiley). He passed the Pet Partner evaluation and is ready to begin volunteering in a couple of mental health facilities and hopefully in Children's Hospitals soon! Beautiful and smart boy! !